The Willow Glen copper repipe specialists that work for us here at Gladiator Repipe, Inc. are guaranteed to have the training and experience required to handle any and all your repipe needs. When the pipes in a building are old and leaking, the problem will only get worse if left untreated. This can lead to a lot of property damage. Fortunately, our Willow Glen copper repipe plumbers are available to work in residential or commercial properties right away. Contact our Willow Glen copper repipe plumbers at 408-444-2696 24/7. You can also visit our experts at 190 N. Montgomery St. San Jose, CA 95110. Copper is the most popular type of metal for water pipes, and our repipe specialists in Willow Glen have access to a warehouse filled with the materials for the copper pipe replacement in Willow Glen process. Plumbers have been using copper connectors, faucets and pipes for over 50 years. Copper pipes last for a very long time, and it is quite possible to replace a section of pipe at any time in the future. 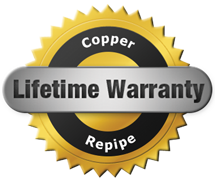 We only hire knowledgeable and licensed Willow Glen copper repipe plumbers to work for our company. We only higher the most qualified repipe specialists for our Willow Glen team because this will protect you from a poor pipe repair or replacement. Customers can count on us to create a work plan for a Willow Glen copper repipe job at a business or home so that property owners can return to the building as quickly as possible. When customers contact us for information about Willow Glen copper repipe, we arrange an evaluation of a building to provide an estimate for the service. Our plumbers will arrive in a logo-embellished van so that our customers feel safe permitting the technicians inside a building. This estimate includes the cost of labor and the materials. At the same time, we can talk about how long the copper pipe replacement in Willow Glen will take. Willow Glen copper repipe services are affordable, and we create a payment plan that includes credit cards, cash or credit cards. When a property owner is having serious problems with the pipes in a commercial or residential structure, it is imperative to contact us right away before a building is damaged by dripping moisture. So don’t hesitate. Contact the Gladiator Repipe, Inc. Willow Glen copper repipe specialists today!